These straws are super easy to make. Of course, they can be enjoyed as a nibble or finger food year-round, but I think they are especially welcome at Christmas and New Year’s parties. Mmm. I can imagine them with drinks, salads or thick soups even. 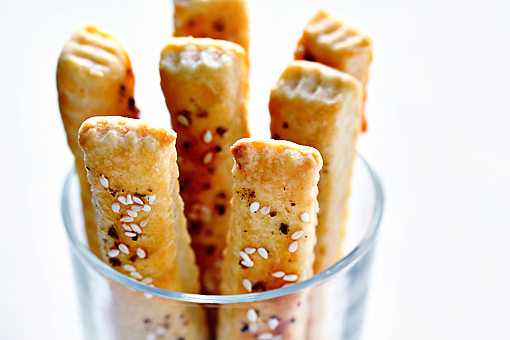 Also, creating these savory treats makes a great project for you and your kids. Just try making them together. I am sure there will be loads and loads of fun. Yes, this is one of those recipe where you only need very few ingredients. I am a huge fan of such recipes. 1. 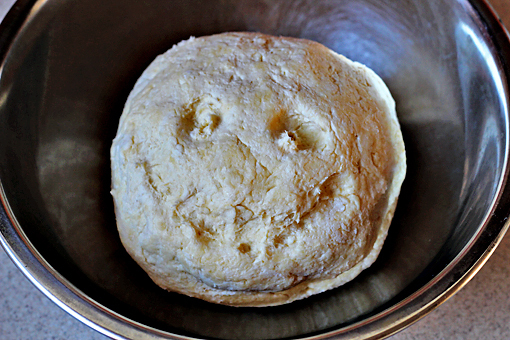 Preheat your oven to 350 °F (175 °C) and line a baking sheet with parchment paper. 2. 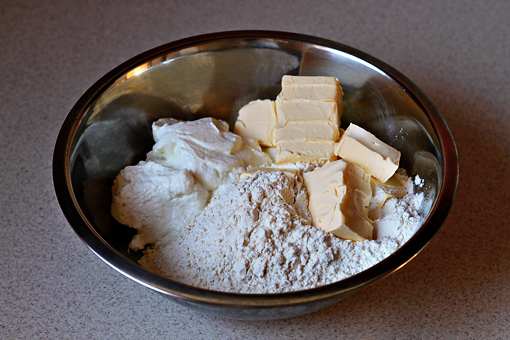 Place the butter, cream cheese, flour, and salt into a bowl. 3. Combine the ingredients by hand just until a nice ball forms. 4. Place the dough onto a well floured surface. 5. 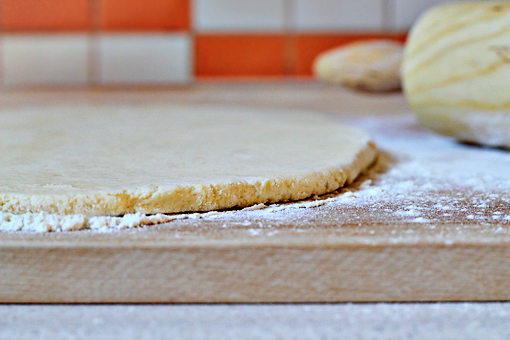 Using a rolling-pin, roll out the dough into about 1/4 inch (0.6 cm) thickness. If the dough gets too sticky during this process, just use more flour to make the work easier. 6. 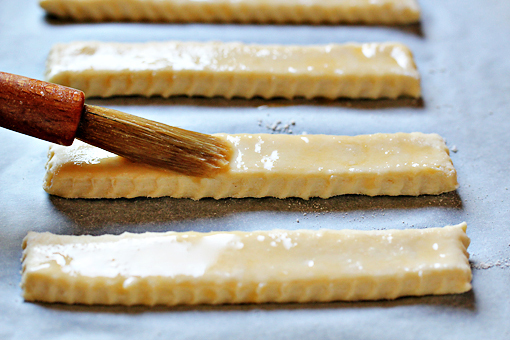 Now cut the dough into even strips. My ones were 3/4 inch (2 cm) wide and 4 1/2 inches (11 cm) long. If you want them to look super fancy, use a fluted pastry wheel cutter. Oh, and it helps a lot if you dip the cutter in flour beforehand. 7. Re-roll any scraps and cut more strips. 8. 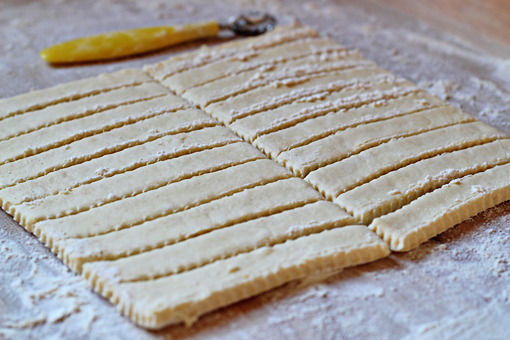 Lay the strips on the lined baking sheet. Brush them with a lightly beaten egg. This will make them beautifully golden in color. 9. 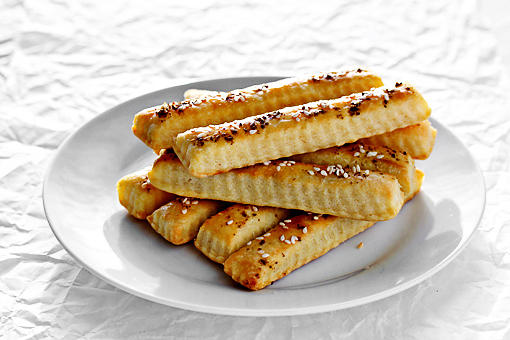 Lastly, sprinkle each strip with some salt, sesame seeds and cumin. 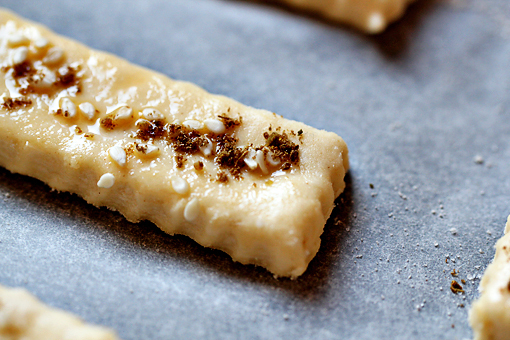 I only had ground cumin seeds on hand when I was making these cuties. I think that the whole ones would look even better. 10. Bake at 350 °F (175 °C) for about 15 minutes or until golden brown. They look wonderful and call for few ingredients. A perfect snack! Yummy and absolutely gorgeous. Bookmarked this too! Wow those straws look really amazing 🙂 What a perfect snack! They seems really simple to make, too. What a wonderful recipe! They sound simple and delicious, definitely a super snack. Just made these for a staff party. They were a definite hit. I twisted each straw and sprinkled them with rosemary and garlic salt. Ahoj, jakÃ© pÅ™ekvapenÃ­, kdyÅ¾ vidÃ­m v komentÃ¡Å™Ã­ch slovenÅ¡tinu. JÃ¡ namÃ­sto cream cheese pouÅ¾il normÃ¡lnÃ­ eidam a tyÄinky jsou super. I just made these for a holiday party. They weren’t as cute as your but SO DELICIOUS! ahoj, tvoje recepty jsou úžasné. Trošku se tím teď “sebemrskám” protože od ledna jako každý rok držím dietu:-) Tyhle tyčinky, tedy podobné znám od malička z domu – dělávala jsem si je jen co jsem se naučila zapnout troubu:-) U nás je recept tento – stejné množství mouky, stejné množství másla a stejné množství tvarohu. Nahoru sůl, koření, semínka…cokoliv tě napadne. Miluju je! Tvaroh se dá nahradit tvrdým sýrem. Good recipe. 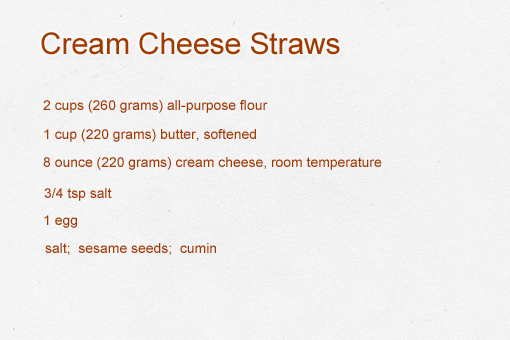 Reminds me of an old recipe my grandmother used to make, same look just without the cheese. I was just wondering can I make this in advance? And how long can they survive for? And also do you keep them in an air tight container or outside in the fridge? resep yg bagus dan dpt dimodifikasi….kerenn…ops i mean this recipe its good….